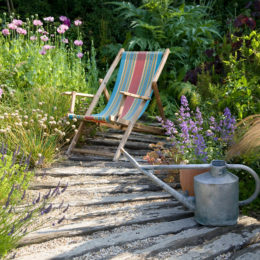 The use of grasses, ferns and strong scented herbs have returned in popularity to the English garden, mostly fuelled by the incredible creative show gardens which form part of RHS Chelsea Flower Show. 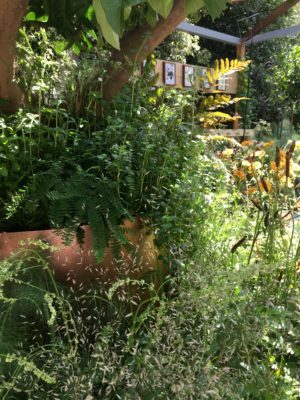 Each year we look forward to seeing an array of show gardens created by top garden designers and sponsored often by large Companies to be donated to good causes after the event. This year we haven’t been disappointed with 10 show gardens and 27 gardens overall, the most that have ever been since the show’s creation 106 years ago. 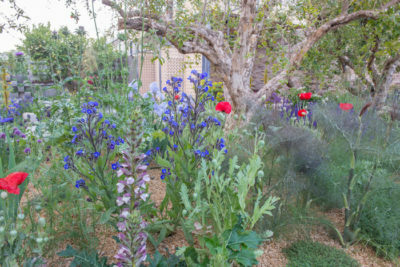 An RHS Chelsea Flower Show medal is the highest accolade sought by garden designers sand a mark of excellence so the pressure is on to make each garden convey a specific story using different structures; planting techniques; textures colours and scents. 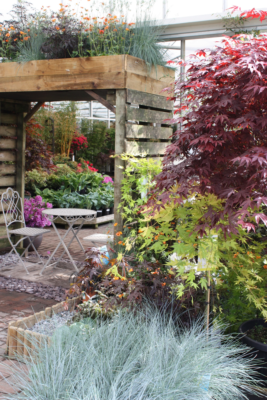 We love The Lemon Tree Trust Garden which this year won Silver Gilt! The garden is inspired by the resiliency and determination of people in situations of forced migration and displacement. The ability to make the most of harsh living conditions and landscapes, and their dedication to create gardens to beautify their limited personal space is another identifier of how gardening can improve your mental health. One of our favourite Garden Designers, Tom Massey, used grasses to evoke the feeling of the harsh surroundings providing texture and movement and herbs to create strong scent throughout the garden. Grasses like Stipa gigantean and Festuca amethystine were loosely planted between perennials like Salvia and Acanthus and strong scented shrubs like Jasminum officinale and Rosa x damascene. Herbs like Thymus serpyllum and Coriandrom sativum were planted in small hanging tinned containers to demonstrate how you can reconcile and use every inch of a small space. There are so many different varieties of grasses, ferns and herbs which can be used to define space within your garden design. Tall grasses in large groups can be the perfect solution for screening an unpleasant view. 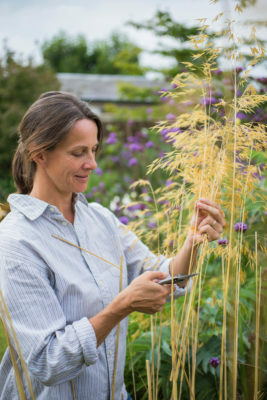 Keep in mind that you’ll cut back ornamental grasses in early spring. 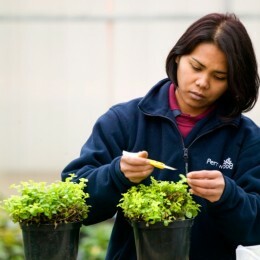 Rosemary and bay will grow tall and can be shaped to provide a lovely scented screen around your herb garden. With a variety of shapes, colours and sizes grasses, herbs and ferns are perfect for container gardens. You can still obtain the effect of movement and texture even if you only have a patio or small balcony. Ornamental grasses add a unique texture to the landscape. Soft, mounding grasses such as Festuca glauca ‘Intense Blue’ look great with colourful acers that have a bolder texture. 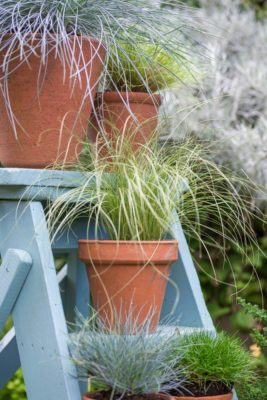 Top tip: For a more Provence feel to your garden plant varieties like the Festuca glauca ‘Intense Blue’ together with white or blue lavender in groups of 3’s or 5’s. Ferns are a great way to carpet a shady moist area in your garden. 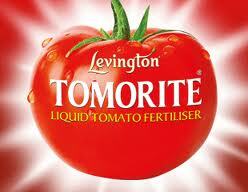 They are excellent ground cover and require very little attention. Their attractive fronds add amazing texture and are perfect companion plants with grasses and perennials. 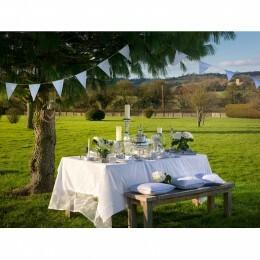 Grasses and herbs, are great for attracting wildlife, especially birds. They’ll use the leaf blades from grasses to make nests and herbs offer natural remedies for birds. 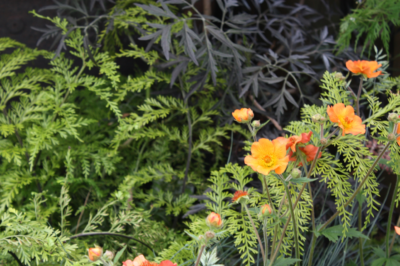 If you would like any further information about how to incorporate #RHSChelsea planting ideas with #ferns #grasses and #herbs into your garden design pop in and speak to one of our plant experts who will guide you on what plants are suitable for your chosen location and type of soil you have in your garden!